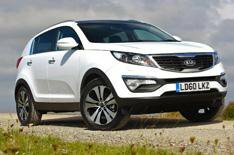 Full Kia Sportage range now on sale | What Car? The full Kia Sportage range is now on sale, following the launch of the First Edition models in August. Buyers can now pick from two- or four-wheel-drive versions of the five-seat crossover, as well as four engines, including new 1.6-litre petrol and 1.7-litre turbodiesel engines. These units come with a six-speed manual gearbox and front-wheel drive and, thanks to their standard stop-start systems, qualify for Kias EcoDynamics badge. The 2.0-litre petrol and diesel models come with four-wheel drive, and the option of manual or automatic gearboxes. The best average economy of 54.3mpg and lowest emissions of 135g/km come from the 1.7-litre diesel engine. The1.6-litre petrol models average 44.1mpg and emit 149g/km of CO2. Four-wheel-drive models average 37.2mpg for the petrol and 49.6 mpg in diesel form. With the First Edition models now discontinued, there are 16 models in the new range, with 1, 2 and 3 trims (prefixed KX on the four-wheel-drive models). The top 3 trim is also available with a sat-nav upgrade, which includes touch-screen sat-nav, a reversing camera and an upgraded stereo. The entry-level 1 models come with alloys, air-conditioning, four electric windows, front foglights and cornering lights, rain-sensing wipers, Bluetooth, cruise control, and MP3 connectivity. The 2 models add part-leather upholstery, roof rails, reversing sensors, a panoramic sunroof, larger alloys, a luggage net, and a trip computer. Go for the top 3 trim, and youll also get full leather upholstery with heated seats, dual-zone climate control, xenon automatic headlights and 18-inch alloys. All are covered by Kias transferable seven-year/100,000-mile warranty, and prices start at 16,495.